What would you do if the world was crumbling to pieces…and everyone believed you were the only person who could put it back together? Terrorists have just bombed Disney World. A thousand miles away, a stranger shows up on Iris Spero’s stoop in Brooklyn. He brings with him a shocking secret about Iris’s birth, throwing her entire identity into question. Suddenly, the press is confronting Iris with the wild notion that she might be the miracle the world now so desperately needs. Families all across the grieving nation are pinning their hopes on her as if she is some kind of saint or savior. She’s no longer sure whom she can trust—except for Zane, a homeless boy who long ago abandoned any kind of hope. When no one knows her but everyone wants a piece of her, who is Iris Spero now? And how can she—one teenage girl—possibly heal a broken world? 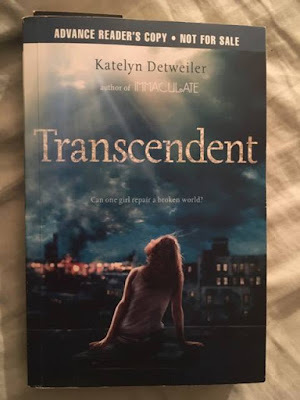 This book is the sequel of the last book I read, Immaculate, by Katelyn Detweiler. In this second book, the main character is the daughter of Mina, the girl we followed in the first one. In this novel, the story is about Iris, a seventeen year old girl born from an immaculate conception. She was living a normal life until the day her mother tells her the secret about her birth, after a tragedy occurred at Disney World. Terrorists bombed the famous amusement park, killing a lot of children. After this big news, she doesn't know if she can trust her parents anymore. Is her dad really her dad? And there's this man, Kyle Bennet, who's harassing them. Wanting Iris to come to the hospital to see his dying daughter, believing that she's a miracle who can save his child. After several ''no'' from Iris and her family, Kyle decides to call the media to tell them that he found Mina and her now grown baby. The night the media came to her house, Iris was out and when she arrived home and saw all of their cars, she decided to go to a shelter with her new friend Mikki, a homeless lady. After two days at the shelter, Iris decided to follow Zayne, a homeless guy from school, and Zoey, his little sister. They decide to go to a relative of those two to stay there a couple days, hoping the media would go tired of Iris's story. After a couple of days, Zoey learns who Iris really is and she insists that she go meet an old friend who was at Disney during the explosions and is now blind. Iris accepts, not knowing what to do. The morning after her visit, Zoey tells Iris that her visit worked, Abby is now out of bed and ready to learn how to live without her sight. After this visit, Iris decided to go back home and to go visit the victim of the terrorist attack. How the people will react? Will this work? Does she really have a power? It took me time to enjoy the story, but when I got to chapter nine, I couldn't stop reading. A lot happens and I was hoping for a romance between Zayne and Iris, I was a little bit disapointed but happy at the same time because a little something happen between those two, but not enough for the fangirl in me. If you enjoyed Immaculate, it's a must read.